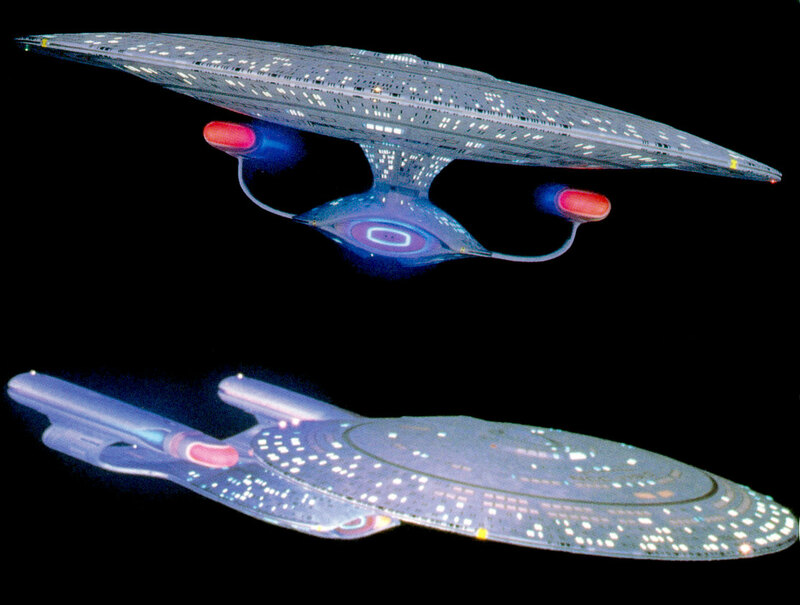 The Enterprise NCC-1701-D, Galaxy class, was designed by Andrew Probert for Star Trek: The Next Generation (TNG). 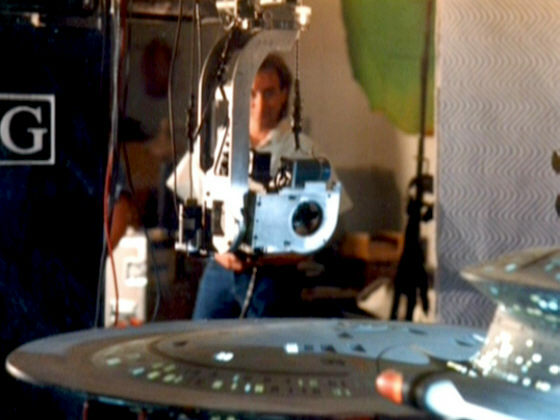 Industrial Lights and Magic (ILM) initially built two miniatures of the Federation starship for the series, closely following Probert's plans. One was 6ft, the other one was 2ft long. Both were capable of saucer separation. In the third season, however, Greg Jein completed a new 4ft long model that subsequently replaced both previous versions, beginning with TNG: "The Defector". 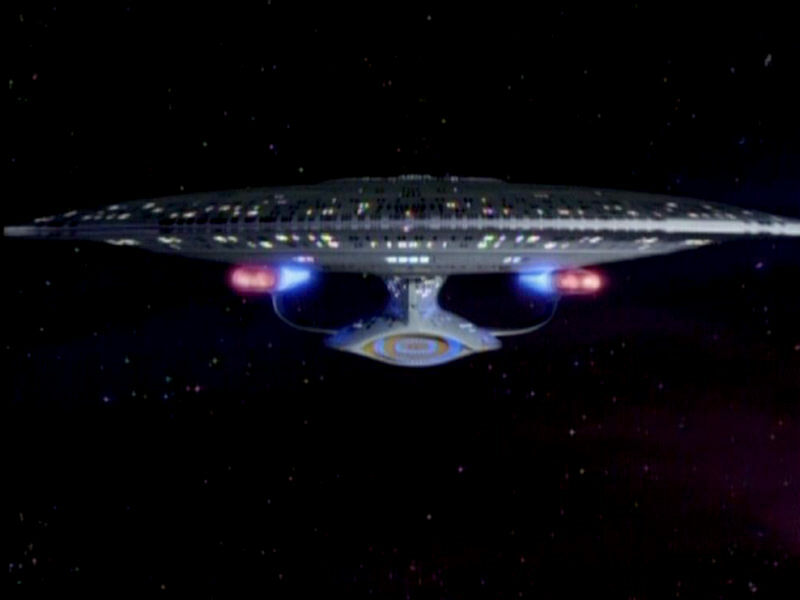 Of course, thanks to stock footage the old version still appeared many times in later TNG episodes. There are a number of differences between the old six-footer and two-footer on one hand, and the new four-foot model on the other hand, which will be investigated in the following. The region of particular interest is the saucer rim, comprising two rows of strongly curved windows with a groove between them. 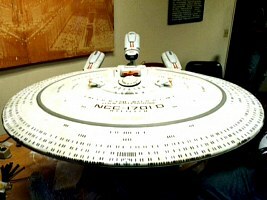 As already mentioned, the 4ft long model replaced the 6ft model starting with TNG: "The Defector" in the third season. So any screen capture from the first two seasons must show the original six-footer or, if the scene did not require great detail, the congruent two-footer. 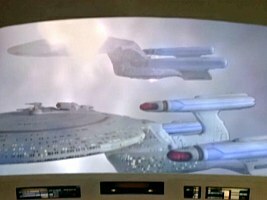 An article at Trekplace spotlights how the model changes from the six-foot to the two-foot version during the TNG title sequence. All new shots since the third season were consistently done with the new 4ft model, but they are often mixed with stock footage of the 6ft model, even in the same episode. Finally, for "Star Trek Generations" the 6ft model was reactivated, repainted in overall more metallic colors and with more contrasting lifeboats. 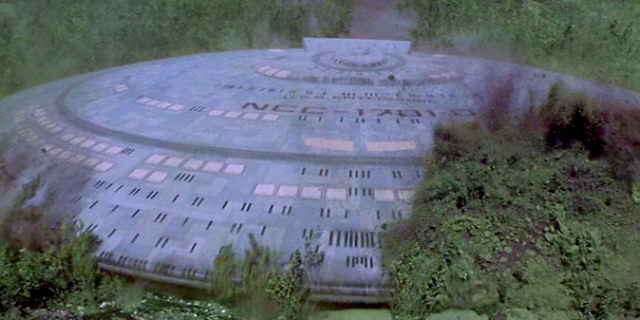 In addition a large stand-alone saucer miniature was built for the scene in which the saucer plows through the woods on Veridian III. 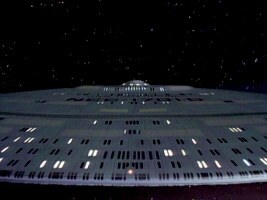 The Enterprise-D in all of its incarnations was mostly filmed upside-down, hence showing the underside, although the dorsal side of the ship arguably looks better. This may have had technical reasons. 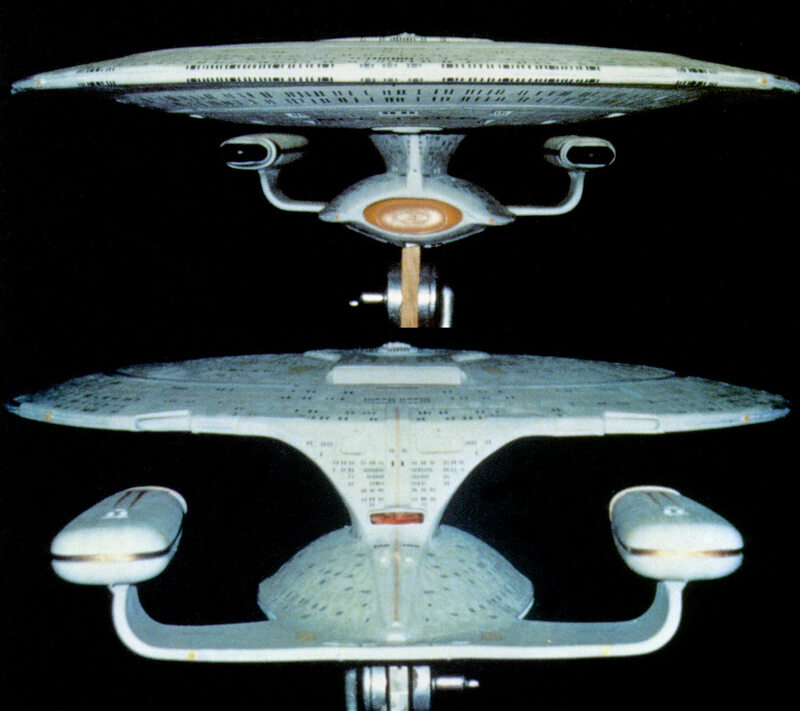 Perhaps the miniature was easier to stabilize when the heavy saucer and nacelles were on the bottom. Anyway, because of this clear preference we have countless ventral views but very few side or top views of the saucer for a comparison. Even photos of the saucer from a head-on perspective are comparably rare. 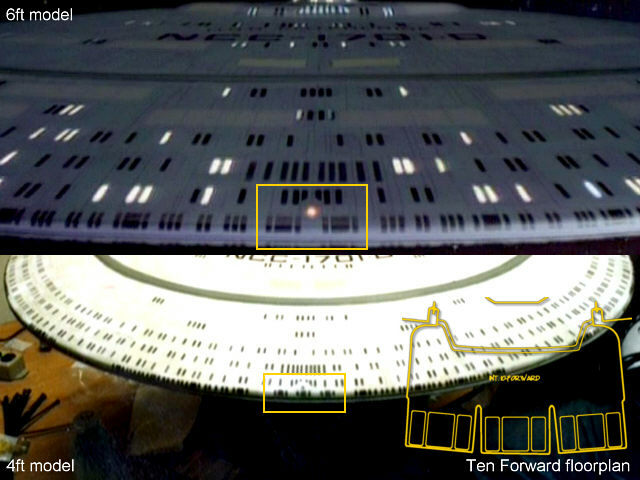 We can see the saucer underside of the six-foot model in TNG: "11001001" and the corresponding view of the four-foot model in TNG: "Bloodlines". It becomes apparent that the hull plates and the lifeboat hatches on the latter are more pronounced. This impression cannot be simply ascribed to the lighting, which is not very different in the two cases. So something must have been changed about the model. 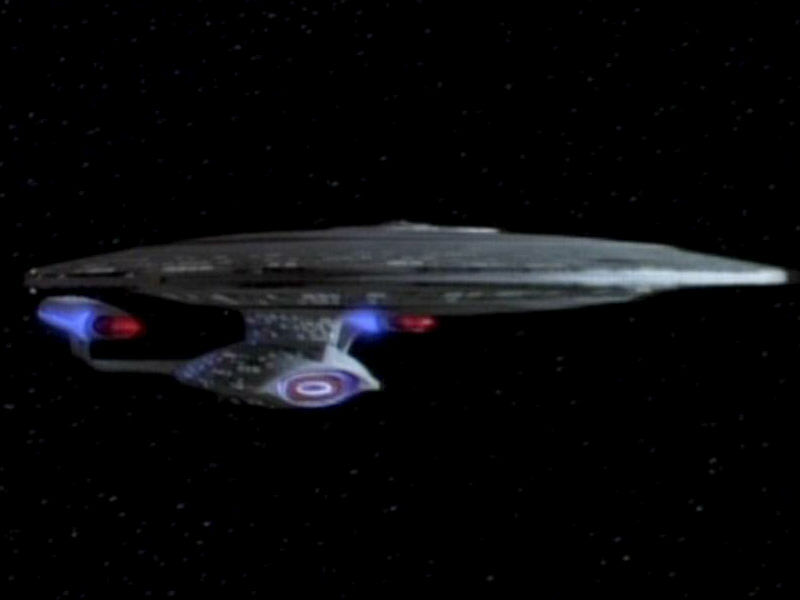 Also, we can make out that the shape of the main deflector dish was slightly modified. 6ft model in TNG: "11001001"
4ft model in TNG: "Bloodlines"
6ft model in TNG: "The Big Good-Bye"
4ft model in TNG: "The Drumhead"
One more thing to notice is that there are no lighted windows in the saucer rim of the 6ft model, while at least Ten Forward is routinely illuminated on the four-footer. But most obviously the saucer rim on the older six-foot model is considerably thinner than on the later version. The side views of the two models confirm this finding. We can estimate that, if previously the rim comprised one deck (meaning that there was a sensor strip sandwiched between an upper and a lower row of windows, all on the same deck), it now spans two full decks with one window row each and a noticeably recessed sensor strip in between. The rim height has doubled relative to the rest of the ship. Either the saucer was overall extended by one deck, or the single deck heights were slightly adapted to fit in an additional deck. 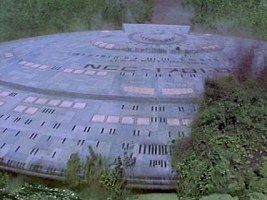 The according changes to the rest of the saucer hull would be too subtle to be noticed on screen caps though. With the knowledge about the principal discrepancy between the models it is very easy to spot it on photos of the miniatures too, even if it was previously unknown which model they actually showed. Some of the photos in Star Trek Mechanics, for instance, can be accredited to the 6ft model, but most of them were taken of the 4ft model. 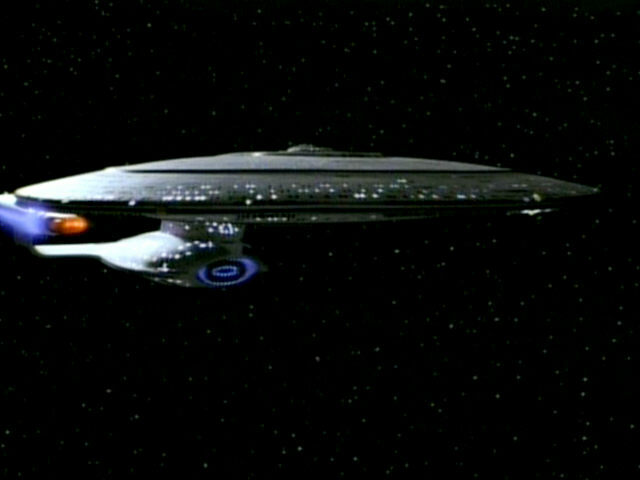 The three-nacelled Enterprise in TNG: "All Good Things" is clearly a modification of the four-footer. 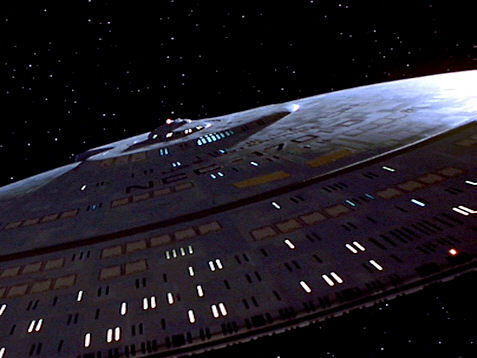 The raised panels and lifeboats on the four-footer are refinements without the need to interpret them as modifications on the "real" starship. We may acknowledge that from slightly different angles and with slightly different lighting the ship may indeed look like it has more pronounced panels than we thought so far. Providing a higher level of detail for the camera may have been one reason to build the new model in the first place. 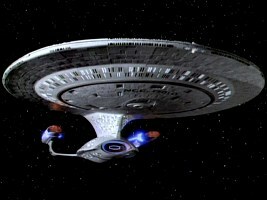 Looking at more screen caps of the Enterprise-D from the first two TNG seasons the ship's hull often looks dull and boring, an impression that the pronounced details may have been meant to correct. The question, however, is why another part of the model, the saucer rim, was changed so substantially. 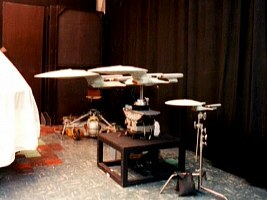 The answer to the question lies in Andrew Probert's original concept of the Enterprise-D. He intended the saucer rim to be a series of dim lounges and of corridors that crew members could take for walks, while being able to watch the stars. This is also the rationale why the numerous windows around the rim are always dark, the probable real-world reason being that this section of the miniature is hard to illuminate because of the internal framework that holds the model together. 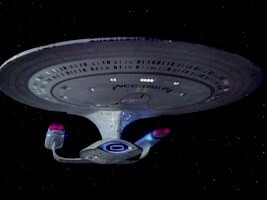 In an interview with Forgotten Trek the designer says, "I thought it could be more romantic or just quiet... some space away from the aluminium gray walls of the ship." 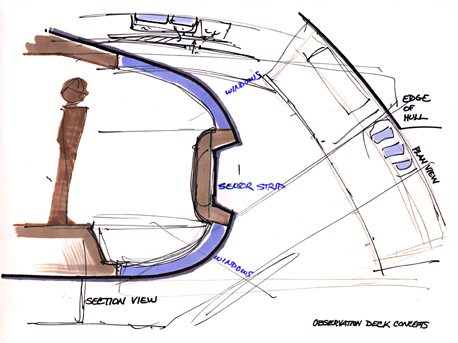 In his concept there would have been just one deck in the rim, with two window rows separated by a slightly recessed sensor strip, the "belly band" as Probert calls it. Andrew Probert left the Star Trek Art Department after the first season. 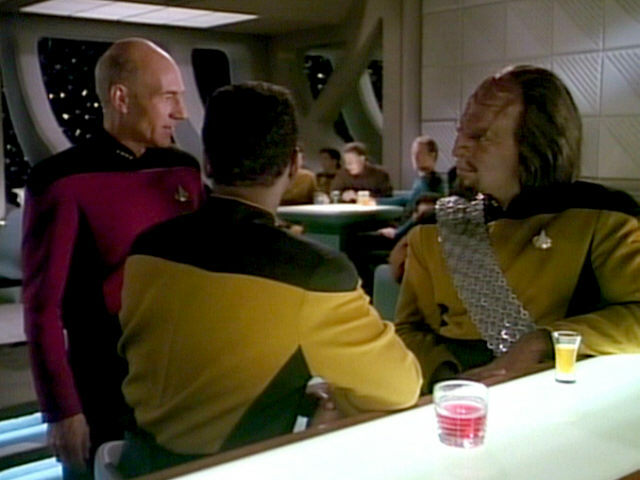 Ten Forward set in TNG: "Allegiance"
The Ten Forward bar that premiered at the beginning of season 2 was not part of Probert's original concept. 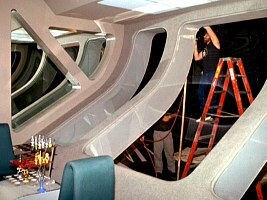 On the contrary, the interior set built for Ten Forward was not to scale with the exterior of the 2ft and the 6ft model. The room height should have comprised both the upper and the lower window row of the saucer rim, interrupted by the sensor strip. But in the set as it was built we can only see the lower rim window (identifiable because of its characteristic downward curvature) that stretches almost from the ceiling to the floor. 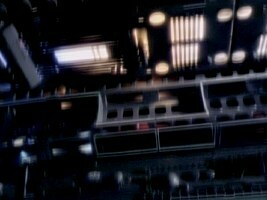 In TNG: "The Child" there is an impressive effects shot with a camera pan from the sensor strip down to the windows of Ten Forward. This shot was obviously created to establish the location of Ten Forward and to provide a sense of the scale for the revised saucer edge. The sensor strip looks still higher in the episode than it should be after the revision though. The reason for deviating from Probert's plans for the Ten Forward set may have been that one large window was deemed more visually appealing than two smaller windows. One of them would have been almost a skylight, while according to Probert's sketch the one near the floor would have been barely visible most of the time and maybe not worth the effort of building it. The dimensions of the Ten Forward set require the saucer rim to be twice as high as on the original miniatures. This, in addition to the benefit of having just one smaller but still detailed model to be filmed, may have been the incentive for Greg Jein to make the four-foot model. 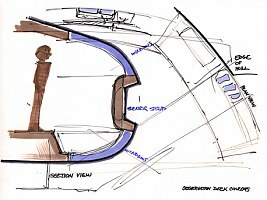 Now that one former deck in the saucer rim has been split into two decks, how can the internal deck structure still match with the windows on the model? The USS Enterprise NCC-1701-D Blueprints by Rick Sternbach (released in 1996) are not a canon reference, but they represent the "official" idea of the post-Probert internal arrangement of the starship. 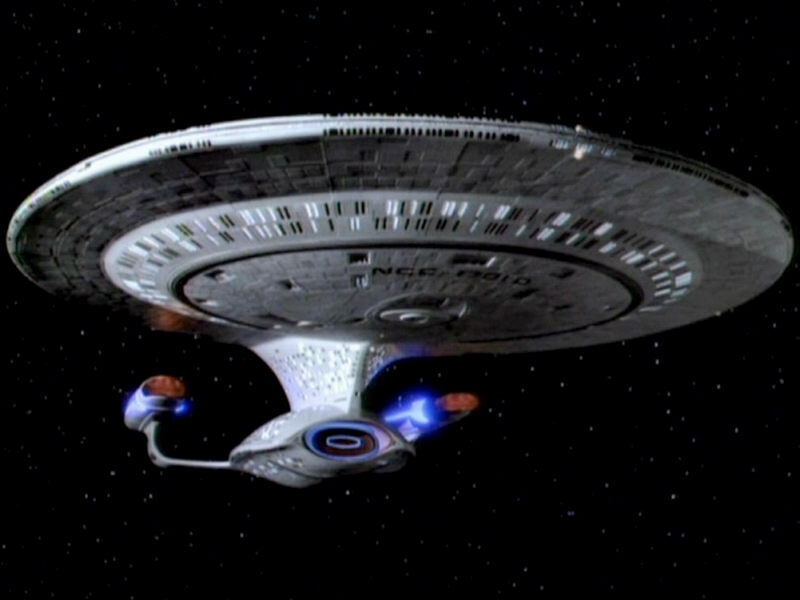 The Enterprise-D as depicted in the book has ten decks down to the lower saucer rim, which is crucial because otherwise Ten Forward would not be on deck 10. On the side view cross-section these decks are all equally spaced, with deck 9 occupying exactly the upper half and deck 10 the lower half of the rim. When we try to correlate the single deck plans 3-10 from the Blueprints with this cross-section at the same scale, they roughly match up. The outlines of the deck plans would sometimes include the space underneath sloped windows and sometimes not, in order to account for the discrepancies. 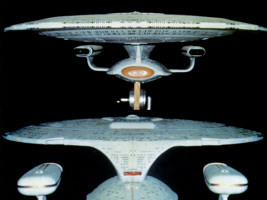 However, looking at the window arrangement on the actual saucer top side, the decks are anything but equally spaced, neither on the original six-footer nor on the four-foot miniature. 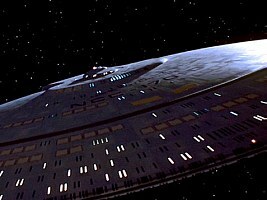 Naturally the windows are closer together in the lower half of the saucer between the phaser strip and the rim, because here the hull slope is steeper than on the top. However, even if we take this into account, some of the decks must be considerably higher than others. 6ft model (repainted) in "Star Trek Generations"
4ft model in TNG: "All Good Things"
Big saucer model in "Star Trek Generations"
4ft model in TNG: "Tin Man"
There is no perfectly orthographic side view screen capture or photograph of the model, but the various drawings of the ship reproduce its window arrangement precisely enough. 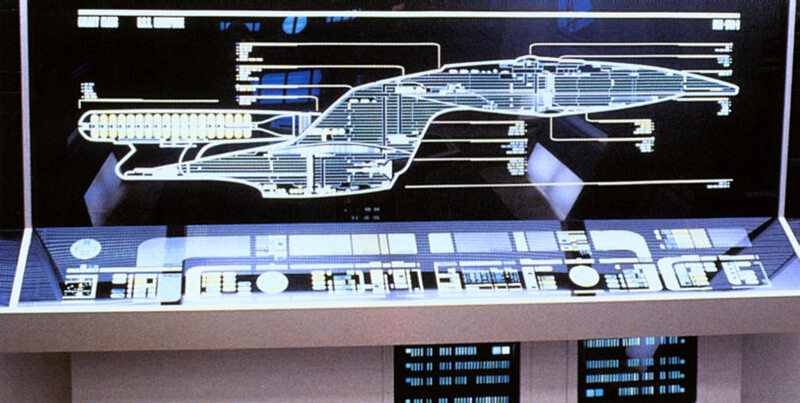 One of the best can be found in the Star Trek Fact Files, depicting the configuration of the four-foot model. Only the overall height of the windows is exaggerated here. Windows on top of one another have a spacing of about one window height in reality, while they are almost touching on the drawing. This may allow us to shift up or down the too high or too low decks a few decimeters. We can see on the side view with the extracted decks that, if decks 9 and 10 are separate, deck 9 would have to be exceptionally tall, unless either deck 7 or deck 8 consisted of two rows of windows and would be accordingly high. 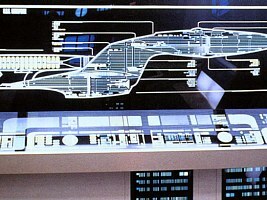 The master systems display in the Enterprise-D engineering takes this into account by giving deck 9 additional skylights that are located near the floor of deck 8. Overall, the decks are equally spaced like on the Blueprints though. Deck 5 must be very tall as well. 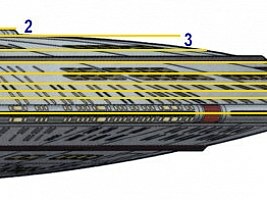 The windows that are located mid-way between the saucer strip and the superstructure of deck 2 may belong either to deck 3 or deck 4 (I assigned them to deck 3), giving us yet another deck with above average height. Taking into account a limited measurement accuracy, deck 10 may be about 3.8m tall, deck 9 winds up at 5m, while deck 8 and deck 7 barely measure 2.6m. Deck 2 appears to be quite low too, but may be submerged into deck 3, which is possibly tall enough. Another discrepancy between the earlier 6ft and the later 4ft model becomes obvious if we look at the exact location of the would-be Ten Forward windows on deck 10, or the exactly corresponding windows on deck 9. On the first model we can make out two sets of three windows. Each set consists of one wide pane enframed by two narrow ones on the left and on the right. 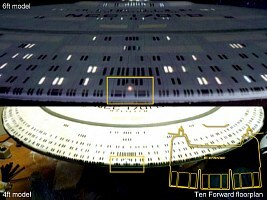 The position light, marking the exact centerline of the saucer, is located half a deck higher between the two window sets. On the 4ft model this arrangement was altered to three window sets, with a central pane below the position light. This corresponds with the Ten Forward floorplan, which consists of three times three windows. The comparison with the floor plan and the set photos, in which all panes are rather close together does not exactly match with the new model, however. Also, some windows on the decks 7 to 10 in the vicinity of Ten Forward were changed as well, while the deck structure, as already mentioned, was not visibly altered. 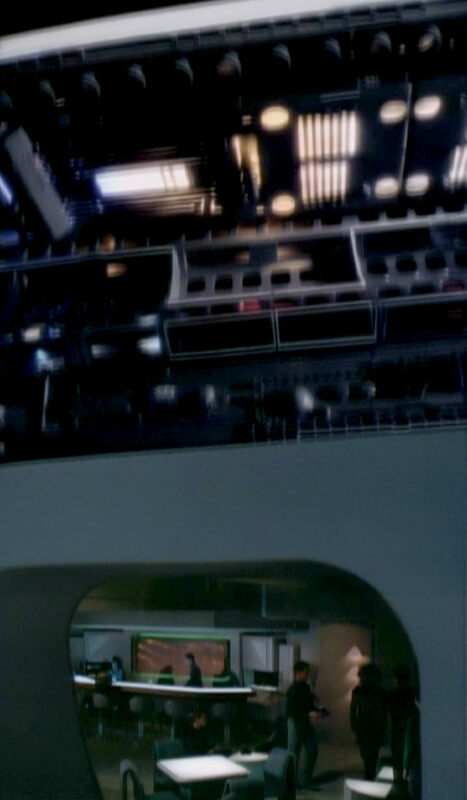 On a different note, the groove between the two corresponding window rows on decks 9 and 10 may be even wider on the Nebula-class miniature, not the later CGI. (The composite picture actually shows the the 6ft Galaxy, but even relative to the 4ft model the Nebula-class rim would be taller.) Whether this has technical reasons, as it may have facilitated the building of the model, or whether the model overshoots the mark of heightening the saucer rim relative to Probert's plans is unknown. In an case, the structure of the Nebula precludes the existence of a corridor according to Probert on this ship class. The Enterprise-D model visually changed from the first to the third-season version when the height of the saucer edge was doubled for the new four-footer. This change became necessary because the producers or set designers decided against Andrew Probert's idea of double window rows. The new miniature was devised to correct the scale of the windows on the outside to match with the newly constructed Ten Forward set. The visual evidence of the set itself and of the high saucer rim, especially the prominent shots in TNG: "The Child" and "Star Trek Generations", has become dominant in the meantime, essentially making the look of the old six-foot and two-foot models obsolete. 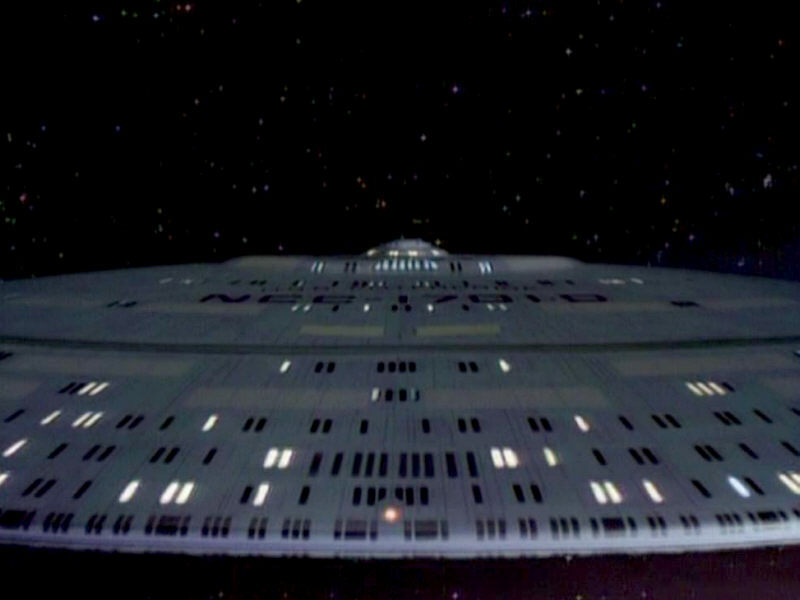 The explanation that the ship was refitted in some fashion prior to the second or third season is precluded because of the extensive appearance of stock footage of the old models in later TNG seasons. So there is no other option left but to accept that the new model with the high two-deck rim is the "true" Enterprise-D, although there are some problems with the deck heights that tend to vary considerably. 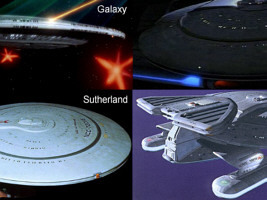 But there exist precedents of decks on the Galaxy class that would be either very high or very low regardless of the retconning of the saucer rim. Summarizing, it is a pity that the Art Department did not go with Probert's well thought-out concept in the first place. However, with Ten Forward's look and location being firmly established and the starship's exterior accordingly adapted, the result of the revision of the plans is not all that bad. 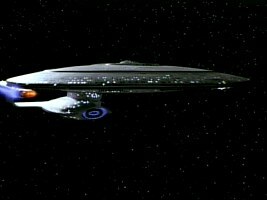 Thanks to Memory Alpha, Forgotten Trek and Trekplace where I found useful information about the Enterprise-D miniatures and Andrew Probert's design concepts. Thanks to JÃ¶rg Hillebrand for several pictures, especially for the matching views of the 4ft- and the 6ft model and for the Ten Forward composite image. The information about the model sizes in "Generations" and the dimensions of Ten Forward comes from Pat Suwalski. Some screen caps from TrekCore.